Most people would probably take a day or two to recover after climbing a volcano but I decided it would be a good idea to press on, grabbing a 17 hour sleeper bus from Banyuwangi to the Central Javanese city of Yogyakarta. At just 110,000 IDR, I was definitely getting value for money and the bus wasn’t too bad – but once you hit the 10 hour mark, it gets a bit much, particularly as the Indonesian buses don’t seek to make rest stops. Pulling into Yogyakarta’s Southern bus terminal at around 9am, I got ripped off for a motorbike ride to my hostel but groggily accepted due to my need for a bed asap. My homestay, Rumah Zen, was great. It was basically someone’s house so was very cosy, with free water, fruit and bread on tap and a friendly atmosphere for just 70,000 IDR a night. It’s a bit further out from the centre but was still walkable. Yogyakarta itself is a city steeped in culture. I’m not sure if it was because I was a little further out but it felt pretty big to walk around, especially in the baking hot sun. The main street, Marlboro, is a hectic mix of market stalls, shops and food stalls and makes for a great wander. On one occasion, me and a friend also stumbled across an art gallery and were treated to a live show too. Yogyakarta is one of those cities where you can stumble across unexpected delights just by wandering round. One such unexpected delight was the cheapest haircut of my life – 7000 IDR (<35p) for a perfectly acceptable trim. We communicated through a picture and repetition of the word “short” but it seemed to work. I’m dreading going home to £10 haircuts now. The other cheap delight in the city was food, which could easily be had for less than £1 from one of the many stalls across the city. 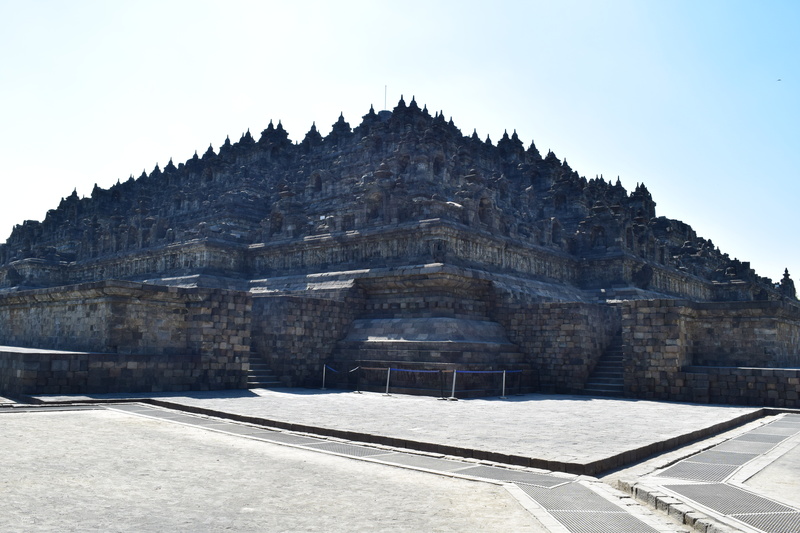 The two big attractions in the city are actually outside the city – the Borobodur and Prambanan temples. They’re both renowned for being spectacular and expensive, costing $30 for a combined ticket. Students, however, get half price so a flash of my student card got me a much cheaper combo ticket (and apparently out of date student cards are fine too). If you’re going to prioritise, Prambanan was nice but nothing amazing, whereas Borobodur was incredible. 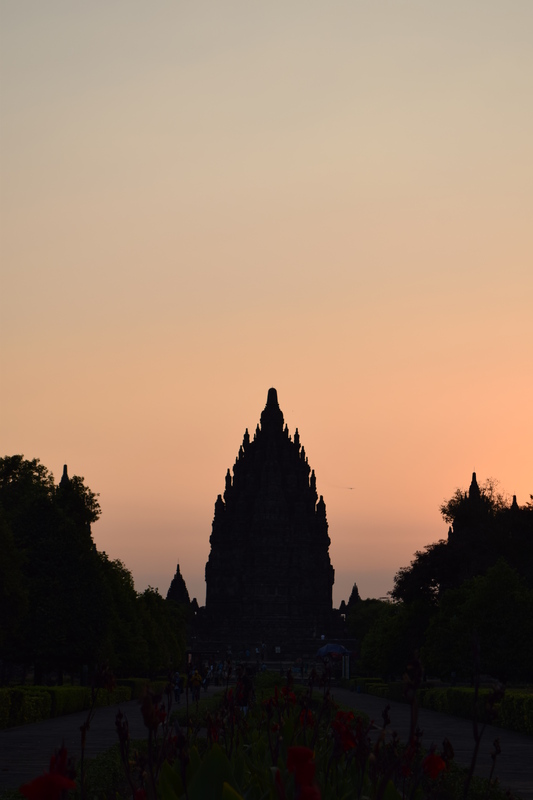 The good thing about Prambanan is that it can be accessed by public transport. Yogyakarta’s green TransJogja buses ply the route – just catch 1A from Jalan Marlboro. Yogyakarta’s bus stops involve you paying beforehand (3600 IDR, regardless of the destination) at the bus stop and then heading through a turnstile to wait for the small buses. I always find it interesting how different countries interpret the bus system. 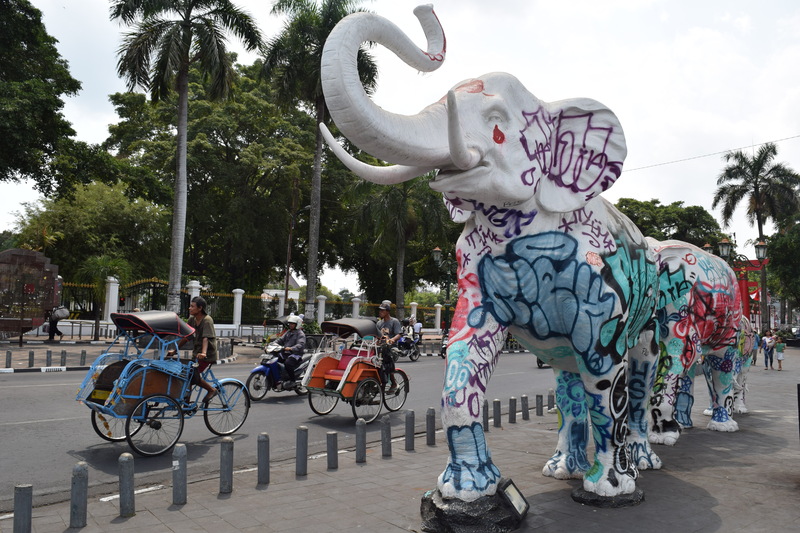 From the bus stop at Prambanan, just cross the busy main road and you’ll be at the car park. I went there for the beginnings of sunset (the temple shuts at 5.30pm) which was pretty dazzling. Only the main few temples still stand due to a 2006 earthquake, the rubble from which you can still see around the site. They definitely brought back memories of Angkor. Borobodur, in contrast, is something different entirely. To get there, the conventional route is to go to the Northern Jombor bus terminal on a TransJogja bus then, from there, grab another bus to Borobodur for 25,000 IDR for the 1 hour trip. Never one to do the “normal” route, me and my friend were in a completely different part of the city and managed to jump on a bus from the ticket office where I was booking my bus to Bandung. The temple is spectacular, even if we did unwisely end up going in the middle of the day. Set amongst lush surroundings, the towering temple is just a joy to photograph. I loved just wandering amongst each level and soaking it all in. If you only visit one temple in Yogyakarta, or even Java, make it this one. Unfortunately, its popularity means you have to weave through a maze of shops and stalls to get out, on a scale I’ve never seen before. It seriously takes about half an hour to get out of the place. Just when you think you’ve escaped, another set of stalls are waiting for you. It’s like a souvenir stall horror movie. But other than that the temple was truly amazing – probably one of the best I’ve ever seen.